Following the success of Swimming Cities of Switchback Sea (Hudson River, 2008) and the Miss Rockaway Armada (Mississippi River, 2006-2007), Swoon has announced her most ambitious and creative project to date: The Swimming Cities of Serenissima. In May 2009, Swoon will set sail in three intricately hand-crafted vessels built from recycled materials and crewed by 35 fellow artists starting from the Karst region of Slovenia across the Adriatic Sea to their final destination in Venice. The crafts will be developed as the journey progresses and once in Venice, these unique vessels will be on display for the public to enjoy along with live music, puppetry, storytelling and other unique performances. This huge undertaking required the support of many, including Deitch Projects, Black Rat Press, Paper Monster and Build it Green. Arrested Motion (AM): Can you tell us how the Swimming Cities of Serenissima came about and what inspired the project? 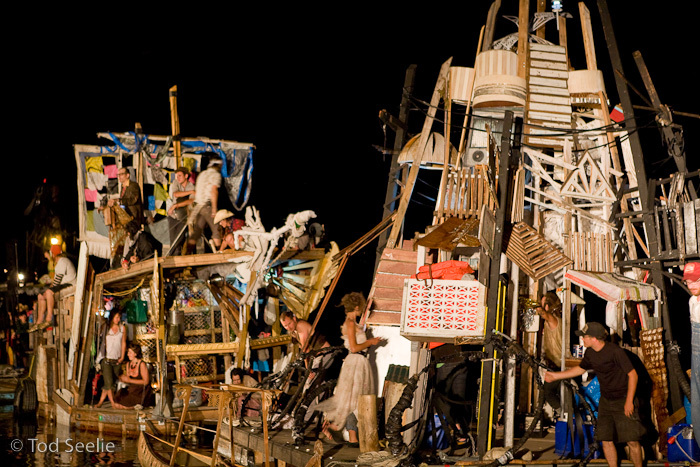 Swoon: I think with any big project, there is almost no single source of inspiration. Somewhere along the way I just started to dream about boats. It was the dream of the perfect blackness of the ocean at night, the wildness that that inspires in my heart, and the dream of a way of living that was a way of traveling too. Slowly ideas of boats started to creep into my work. There followed a few years of talking about it, making little sketches and proposals until finally, one day, in a kind of a meeting of the minds with my friend Harrison (who I have worked with on boats for four years now), the plan to create the Miss Rockaway Armada emerged. Swimming Cities of Serenissima is the direct descendant of Miss Rockaway. 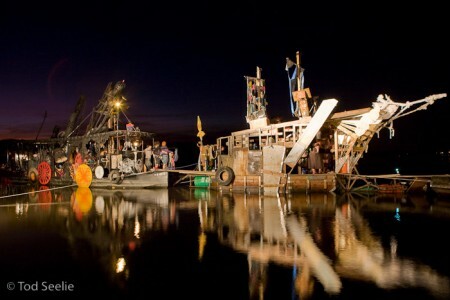 It is something I have wanted to create since the first time I saw Venice, many many years ago, but it was only through working on the boats down the Mississippi that I gained the knowledge necessary to even attempt such a endeavor and also connected with all of the people who are now a part of this project. 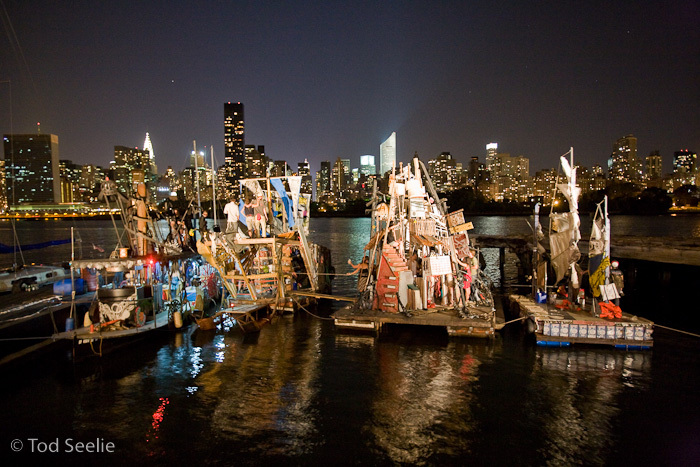 AM: Much of you work seems to center on cities and the people that inhabit them. What is it that draws you to the water and these nautical artistic expeditions? Swoon: The connection between the boats and the street work is in the impulse to create art that interacts with the world in ways that do not depend upon a protected institutional setting. Getting beyond that original impulse, I think that most human settlements spring up around water and we are creating a microcosm of that. AM: Have you been to Venice and Slovenia before? If so, how were they? Venice is one of the most incredible places on Earth and in many ways, the original inspiration for the Swimming Cities project. When you approach it by boat it is very literally, a city rising up out of the ocean. The fantastical unlikeliness of this sight is like a swift kick in the heart of everything you ever thought was possible. Something becomes dislodged and starts running free that will never return to it’s place – you are forever changed by such a sight. This might be one of my highest aspirations for making art. If you could somehow create something which within a glance, changes people’s perceptions of the possible forever, yes, that would be a good thing. That’s what Venice is like for me. And Slovenia? It’s gonna be my first time. AM: How long will the journey take and will you be making stops along the way? Swoon: We will take three weeks to a month to make the crossing. It’s quite a short trip as the crow flies, but we will be doing lots of stopping along the way in order to meet people and collect things for the cabinet of wonders, besides which, junk rafts go pretty slow. AM: Are there any particular themes or issues that you’re looking to explore with this journey? 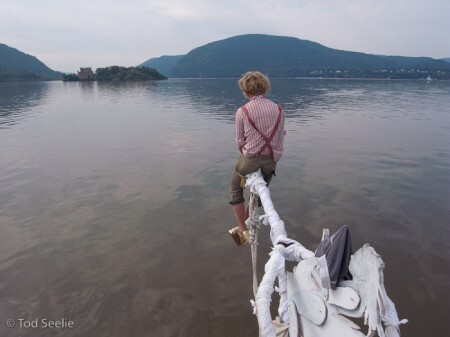 Swoon: There are many, but just to pull out a thread, I have always felt that these boats are an expression of joy and wonder, while at the same time being a map of anxiety. We are making a cabinet of wonders by collecting things we find along the way: seeds, bones, flowers, stories – all manner of things. This impulse is about observing, collecting and sharing beautiful things in the world around us, but there is also an element of the impulse to preserve these things and to pack your whole life onto a couple of hand-made rafts and set sail, which is about the feeling that the way we are living is coming apart at the seams, is destroying the world around us and will not last. These boats are not to be taken as a literal solution, but in the way that art distills a language from our imaginations and creates images that speak to us above and below the level of our spoken language, we are addressing these issues in our form. AM: We love the fact that the craft are made using recycled materials and that you’re starting the journey in Slovenia at the former forest that was the source of the wood that holds much of Venice above water. How important is sustainability to your life and current work? Swoon: Living sustainably is not something that I am very good at. So much of my life and my art making process are hugely consumptive and wasteful, but it is something which I am always seeking to find ways to address and improve. AM: With this being your third nautical adventure, are there any lessons you’ve learned from Miss Rockaway Armada and Swimming Cities of Switchback Sea that you’ll be putting to good use this time? Swoon: We won’t be heading into open waters. On the Mississippi we crossed the widest stretch of the river on a windy day and hit four to five foot swells. On crafts like these, especially rafted together as the Rockaway was at the time, a situation like that is truly terrifying. This is one lesson we learned. Another is about what happens when you reach outward. 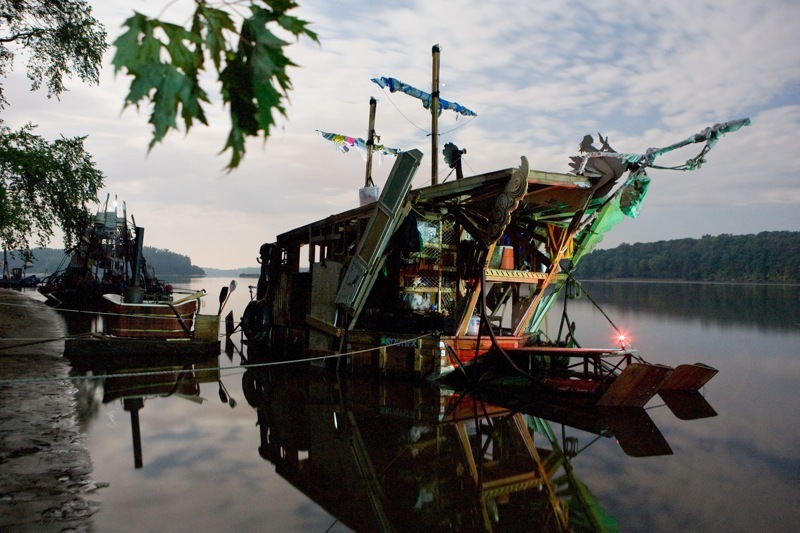 Traveling down the Mississippi and the Hudson taught me that when you make something huge and you bring it to people where they are not expecting to find it, the experience is an astounding one for all of us. With this in mind, we head for unfamiliar territory. AM: This project passionately embraces storytelling in all its glorious forms: art, music, theater, puppetry and good old fashion conversation. How do you coordinate all the different elements of the project and work with your thirty-five artist collaborators? Swoon: There has been a different level of collaboration on each project, from fully collective like the Rockaway, to very tightly directed, like Switchback. The Swimming Cities of Serenissima falls somewhere in the middle. I am in the art director’s seat for this one, but all of the people who are involved are people with experience making big projects happen who are bringing their skills and talents, as well as working really hard to fund raise and make sure it all happens. 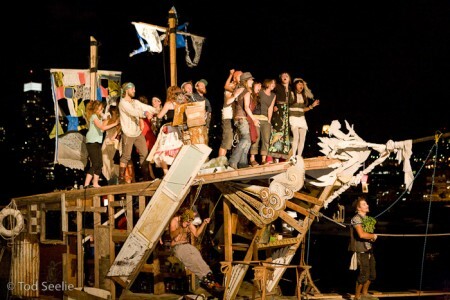 Everyone involved is involved for a specific reason, for their particular brilliance with music, carpentry, mechanics, nautical know-how, logistical masterminding, photography, puppetry, and on and on. 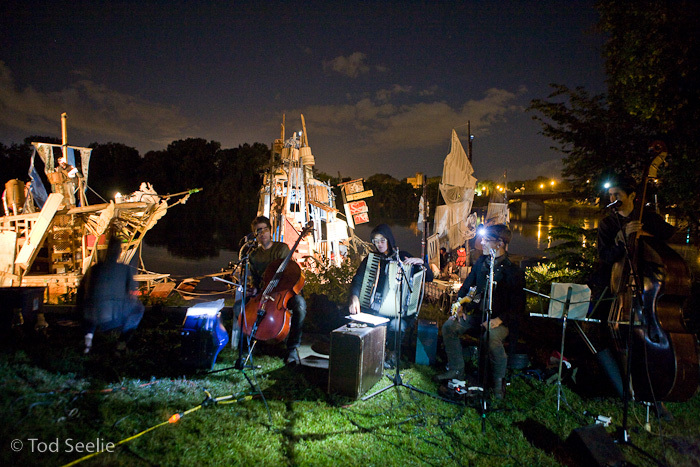 How that all blends together and finally comes out as a traveling musical story telling regatta is part of the hard won magic of working together. AM: Do you or your crew speak Italian and how do you see language affecting the performances and journey? We are all learning Italian, though i think that most of the performances will strive toward not so many words – more visual, musical, universal communication. AM: Thank you. We look forward to seeing updates along your journey. Categories: Art, Features, Installation, Interviews, Street & Urban Art. 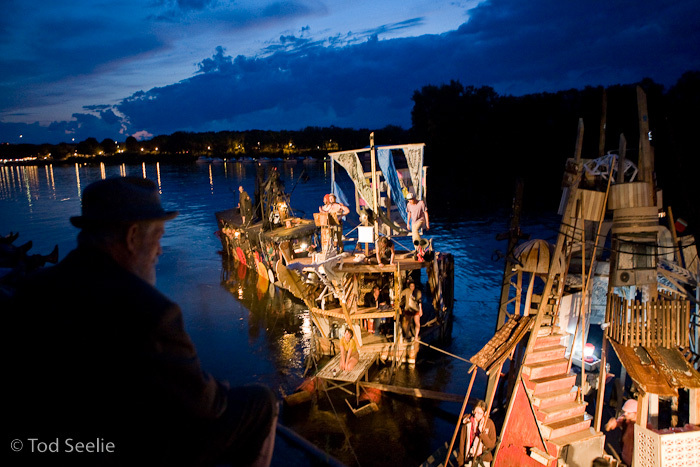 Tags: Features, Installations, Interviews, Street & Urban Art, Swimming Cities, Swimming Cities of Serenissima, Swoon, Venice.